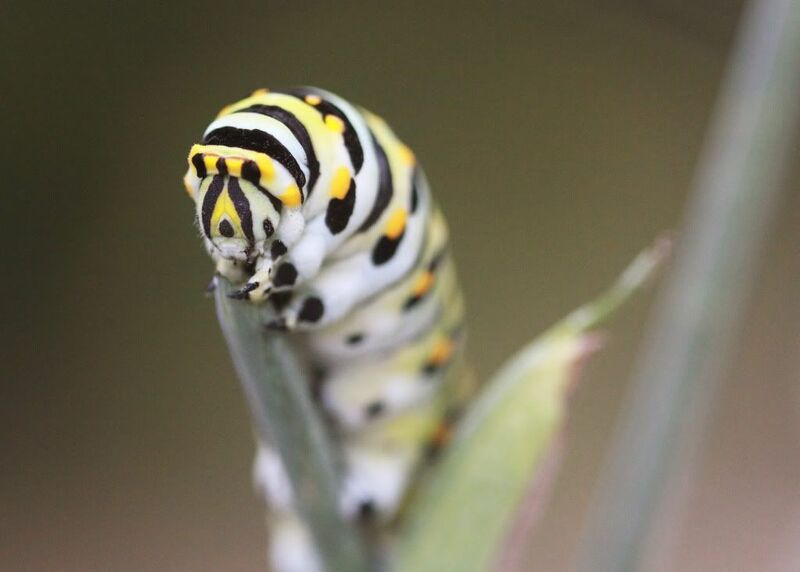 Here’s a pretty neat picture of one of our black swallowtail caterpillars. Right now these little guys are all over our yard, chowing down on our bronze fennel plants. I just love how chubby and baby-like they are—so sympathetic, so cute, in my opinion. I'm always rooting for them. Bronze fennel is such a pretty herb—feathery and delicate, with a beautiful, coppery cast to the leaves. It’s just one of the black swallowtail’s host plants, but I think it might be the most decorative. The caterpillar will also feed on parsley, dill, rue (Ruta graveolens), and Queen Anne’s lace (an invasive that I wouldn't recommend planting). The caterpillar eats for about two weeks, and then it forms a chrysalis. We find these little light brown mummy-like cases all over the sides of our house and on the railings along the steps. (They hang there so quietly.) The chrysalis stage lasts about 10 days (unless the black swallowtail overwinters in chrysalis form). The emerging butterfly is black with yellow, blue, and orange markings. Rob and I try to keep lots of good nectar plants around to feed our butterflies. My goal has been to make our meadows into butterfly smorgasbords. Over our eight years here, I've planted purple coneflower, prairie coneflower, cutleaf coneflower, oxeye sunflower, woodland sunflower, ironweed, goldenrod, milkweed, blazing star, and more. I just hope everything can hang on through this droughty summer.